SecureVideo - Zoom: How do I navigate my SecureVideo account? This article is to help you find what you need after logging in. If you have any questions, always feel free to reach out to Support at (888) 540-2829 or [email protected] . You can reach this page any time by clicking on the "Videoconference" tab along the top of your window. New Session Now: Schedule a new session for right now (it will prepopulate the date and time). New Scheduled Session: Schedule a new session for a future time (you choose the date and time). Orientation Session: Schedule a session with technical support to check your equipment or go through an orientation. For all other issues, please give us a call at (888) 540-2829 or send us an e-mail at [email protected]. 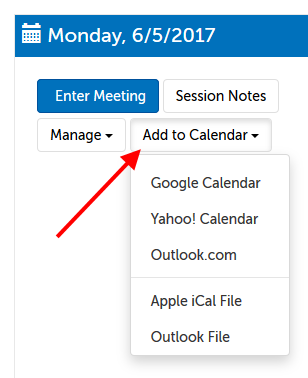 How do I reschedule, cancel or edit participants in a videoconference session? Install Zoom: Download and install our videoconferencing app. Only needs to be done once per device. A. Enter Meeting: Launches your meeting. B. Name of participant (Minimum of 2 characters.) If the participant is a fellow account holder in your organization account, your company name will follow in parentheses. E. Status: displays status of participant. F. Edit: edit participant's information: contact information, invite method, or time zone. G. Remove: remove participant from session. Schedule Next...: Schedule another session with the same participants and settings. The date will pre-populate as 7 days from the time of this session. You can reach this page any time by clicking on the "Support" tab along the top of your window. Getting Started Guide (on the right) will open a PDF guide to all the essentials of using our system. 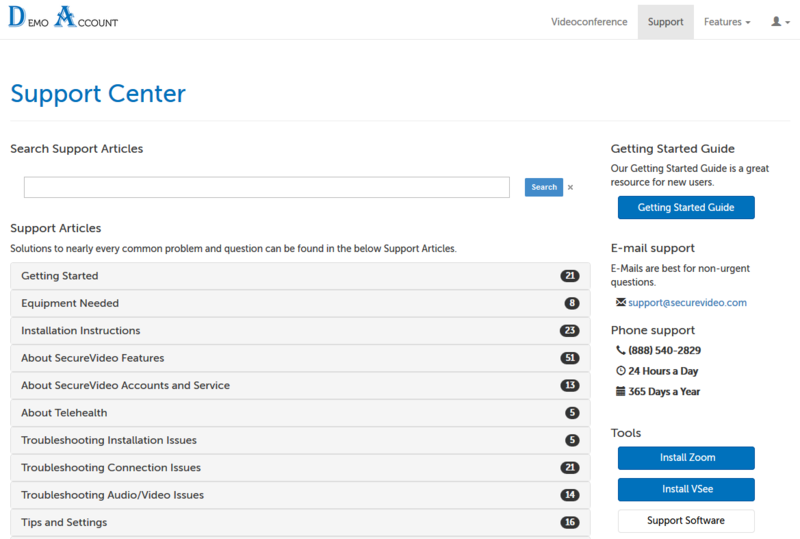 Find the phone number and e-mail address for our support team on the right-hand side column. Click on the section headings to open our documentation categories. The below instructions assume an Account Administrator role, which allows you to view/manage account permissions. Depending on your user role, you may not see all of the following items mentioned. See all possible user permissions in What are the available user roles? Your name (in this example, "Iam Demo"): Edit your account profile information and basic settings (e.g., email address, time zone, etc). 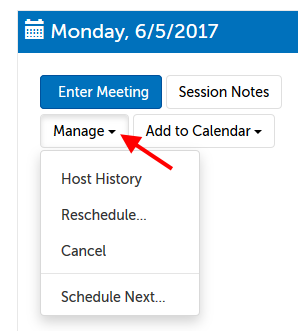 Appointment Slots: Manage the availability for your public calendar(s). My Account: View and/or edit billing information, plan details, and invoice history for the account. My Contacts: View, create, and/or edit your saved contacts. My Settings: Access your e-mail notification settings and/or close your account. Session Usage: Look up session history for your user account. If permitted by your user role, you can also look up session history for other users. Account Users: Displays all the users on your Enterprise account. From here, Account Administrators can manage account users, Clinical Supervisors can access users' session notes and E-documents, Schedulers can schedule sessions on behalf of users, and Billing Managers can view available user licenses on the account. Account Services: Set up account services to require payment before your participant can enter the session. Log Off: Log off of your account. The below instructions assume an Account Administrator role, which allows you to view/manage account features. Depending on your user role, you may not see all of the following items mentioned. My Listing: Enable, create, and/or edit a listing in our online clinician directory. Messages: Access messages sent to you through your directory listing, or replies to SMS invitations. Session Notes: Enable, create, and/or edit session notes. BAA: Access the Business Associate Agreement for your account. How do I access my Business Associate Agreement with SecureVideo? Branding: Customize your account with your own logo, colors, and URL. How do I set up branding on SecureVideo? Get Paid Online: Connect a Stripe account, or add a PayPal or Authorize.net merchant button to your waiting room page. E-Documents: Create electronic documents or access received documents. Custom Links: Add a custom link to your waiting room pages. Recordings: Description of recording feature. API: If enabled, view your API pricing and keys from here. This article was last reviewed by our Support team on August 8, 2017.